Home > Blog > Close and Personal with Campbell McConachie. Close and Personal with Campbell McConachie. 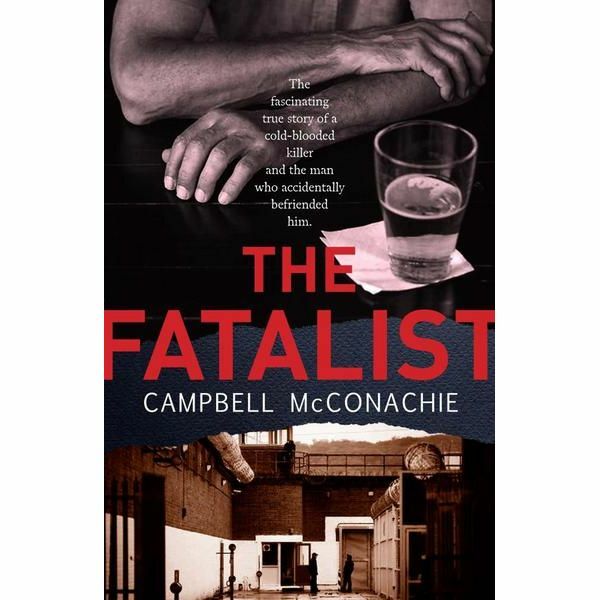 The Tasmanian Writers Centre interviewed Campbell McConnachie to discuss the story behind his debut novel The Fatalist, the incredible tale behind the life of serial killer Lindsay Rose, a man Campbell unknowingly befriended at his local pub. I thought perhaps the discovery of Lindsay’s secret had spurred Campbell into the writing life, but he says he has been interested in writing since he was a boy, and was just slow to get started. As soon as he finished high school he began training in the stock broking industry, with his plan being to get a job and earn money quickly until he had enough to focus on his writing. However while he was working in this field he read all about the writing craft and undertook a Masters of Arts majoring in creative writing. Campbell first met Lindsay Rose at a pub in Burwood, NSW in 1988. He describes him as having a big personality- a gregarious, confident, extraverted man. He liked to be in control and to show off, occaisionally organising excursions for regulars at the pub. One time he booked a table on a Sydney Showboat and the group spent the evening wining and dining in style. Campbell moved away from Burwood a couple of years later and didn’t see much of Lindsay. He was watching the news with his girlfriend when the TV screen displayed a photo of Rose, inviting the public to come forward with any information regarding his suspected murder of two prostitutes. This was a staggering reality to be faced with. Campbell tells me of his complete disbelief. His first thought was that maybe it was a coincidence. I asked Campbell when he decided he wanted to tell Lindsay’s story. He says the idea was in his head early on, but he didn’t act on it until 2004. He went to the state library and started researching Lindsay’s life, discovering he had been an ambulance driver and had worked during the Granville train disaster. He then became a private investigator, which Campbell believes helped spur his criminal behavior. I asked Campbell whether he thinks Rose is a Psychopath. This is a question that runs as a parallel thread throughout his book. He has spoken to forensic psychologists and poured over criminal reports but says he still doesn’t know. Psychopathy is a spectrum, with Rose certainly higher up the ladder than most. Rose had a troubled childhood, and from a number of traumatic experiences he developed the skill of compartmentalisation as a coping mechanism. Campbell believes he applied this skill to his criminal career, storing away any feelings of guilt to allow him to justify his actions. During the interviews Campbell conducted with Rose it became clear that although he accepts his actions were wrong he still believes two of his victims deserved their fate, and feels no remorse. Rose was initially against the idea of a book being published about his life. Throughout his criminal life he worked with a number of dangerous individuals and was worried it would compromise his security information and endanger his family. Campbell kept in contact with him for a few years, exchanging letters and visiting in person, and after a while Rose grew to trust him, giving the okay for Campbell to publish his story. I was interested about Campbell’s writing process, once all the research had been completed. He says there was a big overlap between the research and the writing. Every time he spoke to Rose he would write a trip report. He wasn’t allowed to take pen and paper or any recording devices into the prison so it was important to write down all the details immediately after the interviews. Campbell has an IT background, so he found it helpful to set up a spreadsheet to get a clear picture of all the timelines. Once he started writing all the information down it helped organsie his thoughts and showed him what was missing from the story. Campbell says he took time off work to write the first draft, which ended at 120,000 words, still with more research to be done. The writing was not a linear process. Campbell kept going back and forth between writing and further investigation. Campbell says the most challenging aspect of writing the book was compiling all the information and putting it in the right order. He originally imagined the book as a series of vignettes, but during the refining process he discovered the stories read better as a coherent whole. Of course the re-reading and editing process took considerable time. Campbell eventually divided the document into three, each one telling the story from a different perspective, his story, Rose’s story and the police investigation. The Tasmanian Writers Centre looks forward to hearing more about Campbell’s future writing journey and thanks him for taking the time to speak with us.